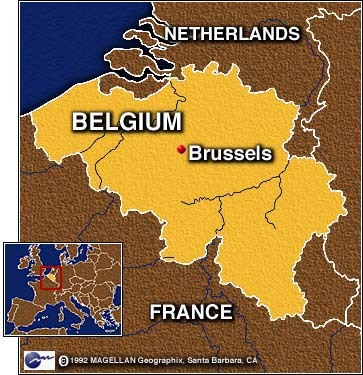 BRUSSELS, Belgium (CNN) -- NATO officials vowed Saturday that airstrikes on Yugoslavia would continue, despite international condemnation of Friday's deadly bombing of the Chinese embassy in Belgrade. NATO officials investigating the embassy attack are looking into the possibility that intelligence information used to identify the building was several years old, CNN has learned. 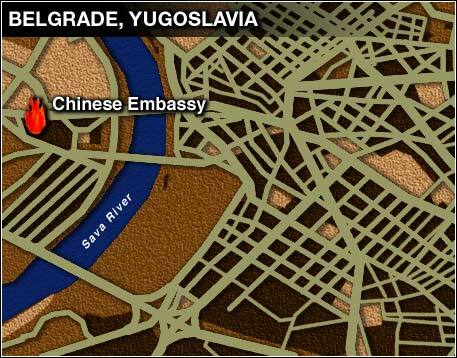 The embassy was the intended target of the attack, which was part of a heavy overnight bombardment of the Yugoslav capital. 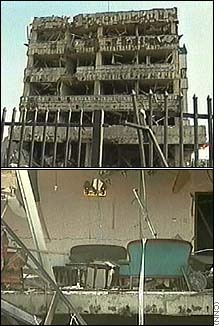 But NATO planners say they mistakenly believed it was the headquarters of a Yugoslav military procurement organization. 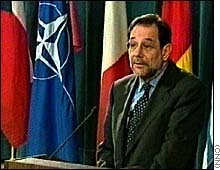 "We've recognized that this is a mistake, and this is a mistake we regret," said NATO Secretary-General Javier Solana. 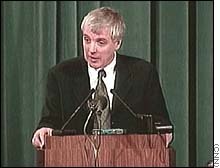 "(Friday) night, a great deal of what was done was done accurately and professionally," said NATO spokesman Jamie Shea. "Of course, everything is overshadowed, as we expect, by this one very, very bad mistake." Solana said the attack on the embassy would not sway NATO from its goal, which he said is "none other than to stop the ethnic cleansing (in Kosovo) and to assure that Kosovars can return to their homes in peace and in security." Chinese television reported that three people were killed and 20 injured in the attack. Five Chinese diplomats were in the intensive care unit of a Belgrade hospital, and doctors said three of them were fighting for their lives. 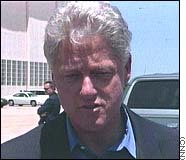 U.S. President Bill Clinton offered his own "profound condolences" to the Chinese for the mistake -- but defended the NATO campaign as necessary to stop a Yugoslav crackdown on ethnic Albanians in Kosovo. "Someone, sometime, has got to stand up against this sort of ethnic cleansing and killing people wholesale ... solely because of their religion and ethnicity," Clinton said. 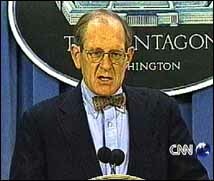 "There is no such thing as clean combat," said Pentagon spokesman Ken Bacon in Washington. "We have the best trained forces, but there is no way to avoid collateral damage or unintended consequences when weapons are employed to solve what might have been solved diplomatically." The bombing triggered violent demonstrations at U.S. diplomatic outposts in Beijing and other Chinese cities. Members of Belgrade's Chinese community marched through the streets denouncing the attack. At China's request, the U.N. Security Council convened for a late-night session Friday, during which NATO's campaign was denounced by the Chinese and Russian ambassadors. "NATO is going beyond all borders," said Russia's U.N. ambassador Sergey Lavrov. "We are really disturbed over this barbaric action. We are outraged over this barbaric action. And we call and demand an immediate investigation." "The Security Council cannot let this go without any consequences," he said. While conceding the embassy bombing was "tragic" and "awful," Clinton rejected the characterization of NATO's actions as "barbaric." "What is barbaric is the intentional ethnic cleansing that (Yugoslav President Slobodan Milosevic) has provoked over the last 10 years," Clinton said. Also on Saturday, a new influx of ethnic Albanian refugees from Kosovo arrived in Albania. Some 500 refugees an hour -- about 5,000 in all -- crossed the border at the Morina border checkpoint, according to the office of the U.N. High Commissioner for Refugees. Most were from the city of Pec. 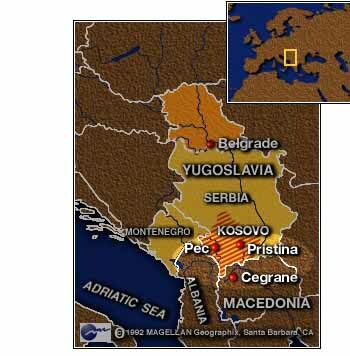 UNHCR officials said the refugees have reported incidents of Serb attacks and mass killings in Pec. The newly arrived refugees were described as very emotional and malnourished. Officials with the Organization for Security and Cooperation in Europe (OSCE) told CNN that from their viewpoint on Albania's border with Kosovo, they spotted a line of refugees stretching 7 kilometers (4.3 miles). Also on Saturday, the family of moderate Kosovo Albanian leader Fehmi Agani, who participated in the failed Kosovo peace talks in Rambouillet, France, confirmed that he had been found dead. 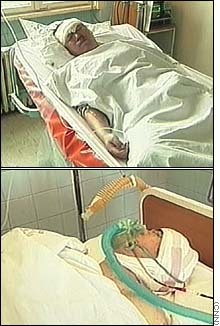 Family members said that he had been arrested Thursday by Serb police and was not seen alive again. 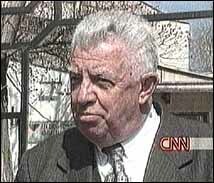 Yugoslav officials accused the rebel Kosovo Liberation Army of killing Agani, a charge the KLA denied. NATO's bombardment of Belgrade late Friday night and early Saturday morning was among the fiercest of its 46-day Yugoslav campaign, knocking out power throughout the city. Among the facilities attacked, according to NATO, were two military headquarters, a command center, electricity generation and distribution centers, communication lines, seven bridges and an airfield outside the capital. 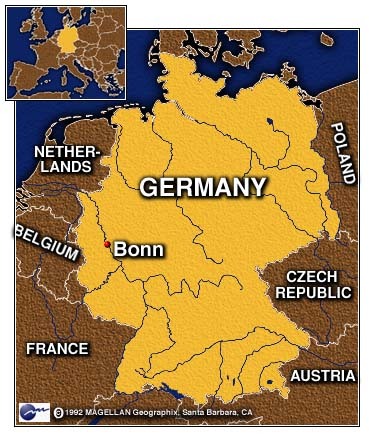 Also on NATO's list were two ammunition storage centers and fuel depots. 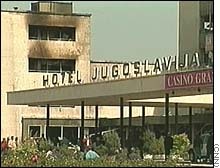 Also struck was the Hotel Yugoslavia, which NATO officials say was the headquarters for Zeljko Raznjatovic, a Serb paramilitary leader also known as Arkan, who has been indicted for war crimes in Bosnia-Herzegovina. Raznjatovic said Saturday that NATO's attempt to strike at his group, the Tigers, was unsuccessful. "They didn't hit no headquarters of Tigers. They didn't hit even one Tiger," he said. "They're all alive, and they're going to wait for the NATO ground troops." On the diplomatic front, Russia's special peace envoy, Viktor Chernomyrdin, met in Bonn, Germany, with German Chancellor Gerhard Schroeder and Carl Bildt, the former Swedish prime minister who has been appointed as a special U.N. envoy on the Kosovo crisis. Bildt told CNN that they discussed the "political principles" behind a peace plan put forward last week by the Group of Eight nations, which is made up of Russia, Japan and six NATO countries, including the United States. Chernomyrdin had been scheduled to travel Sunday to Belgrade but decided to postpone the trip. Correspondents Brent Sadler, John Raedler and Carl Rochelle contributed to this report.